You can send it to support@emlid.com or via PM here. upgraded to v2.17.3 from 2.17.2. Age of differential keeps increasing when using Lora. Age of differential time does not update properly. Full reports have been sent. Hi, are you sure this is related to the update? Could you describe setting used on Lora (base setting and Hz) and distance between rover/base used? And RTK setting on rover? I’ve made a test and can’t confirm this issue. I can assume that you might have the wrong settings or bad environmental conditions. Can you share your raw logs and full system report, please? I have completed dozens of tests of receiver initialization with versions 2.17.3 and 2.16.0. All of 2.16.0 were OK. Initialization to ‘fix’ lasted from 1 to 2 minutes. Only a few with version 2.17.3 had such results. This version is not stable. The bug is probably in the beginning. Version 2.16.0 always starts initialization with GPS + GLONASS and version 2.17.3 does not include GLONASS at the beginning, although it is ON. This is clearly visible in the logs. I already downgraded to v2.16.0. Will do test today if the problem persist. Maybe my lora is broken. I’ve tried to reproduce your issue without success. I got fix status in around 2 min on both devices with not the best possible NTRIP caster and satellite view. In the solution file during some test I can see the same behavior but with 2.16.2. 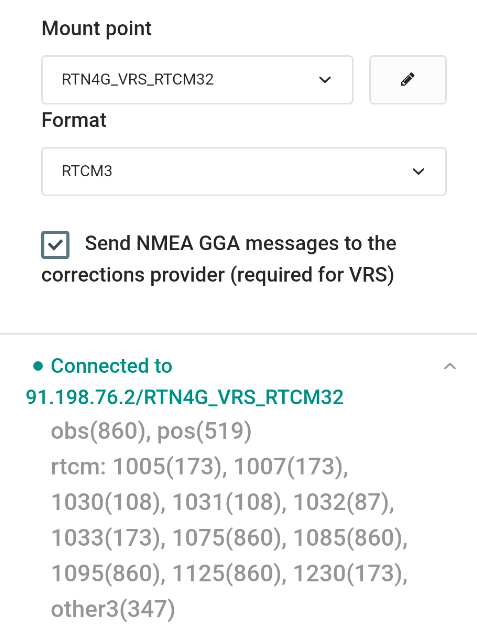 As we didn’t change anything in RTK engine, I can assume that it’s mostly connected with NTRIP caster and not ReachView version. However, I’ll look into it. I will try it also on one of the receivers with the v2.16.2. These tests are performed under identical external conditions, the same smartphone (android), mobile wi-fi, the location of the receiver. Maybe it would be worth comparing the settings. Can you share your ‘Simple report’ or compare with those ‘Full reports’ that I sent directly to EMLID? The details of the data stream can also be relevant here (RTCM messages from the correctionn provider). It is worth finding the reason, because other users also report it. It can be outside of the receiver. This also can not be ruled out. I have done several initialization tests in several places and I have full confirmation that the initialization for version 2.16.0 takes place in such locations about 30 seconds and never exceeded 40 seconds. The test was on the ReachView 2.16.2 application, i.e. I made this upgrade from 2.16.0, which you mentioned. The tests were carried out only on the RTN4G_VRS_RTCM32 stream, but it is known that there is a Beidou limitation if GLONASS. I moved with the receiver turned on, located on the trunk of the car. Before each measurement, I turned off the receiver ‘Reboot’ by default. This was to determine the initialization time, i.e. without the time to run the application. These 30 seconds (epochs) to fixed are exactly what’s in the U-blox cold start GNSS engine specification, for the M8N. Thus, it completely confirms the technical assumptions of the receiver. It is important, therefore, that this development version 2.17.3 retains these elements from 2.16.2, because for the same settings the receiver did not provide ‘fixed’ solutions at all. Have your tests been from RTCM3.2 or RTCM3.3 caster? 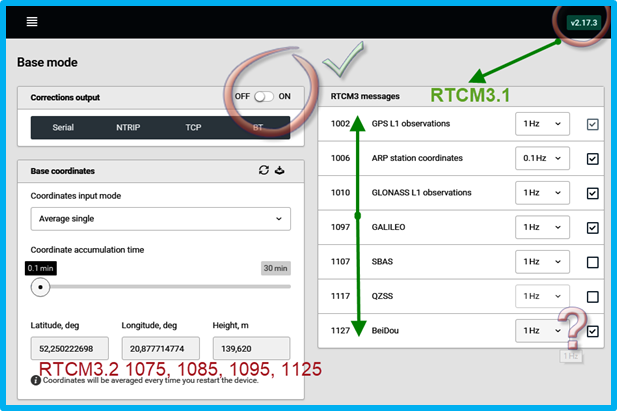 RTCM 3.2 needs unlocking the fourth GNSS service on ‘RTK Settings’. ie. Beidou with GLONASS together. A request to the EMLID team to test. I’ll look into it and provide my comments as soon as possible. and rebooted, but that didn’t fix the problem. Merrifield device shows up briefly in the device manager, but the RNDIS device never shows up under Network Adapters like it used to. I reinstalled the Intel Edison Ethernet over USB driver, but that didn’t affect the problem. Is it possible that RNDIS support wasn’t provided or is broken in this release? -Using www.rtk2go.com, it is not possible to resolve DNS and you are forced to use IP address. Reachview kind of hangs when you type the name, but with IP address it settles fast.